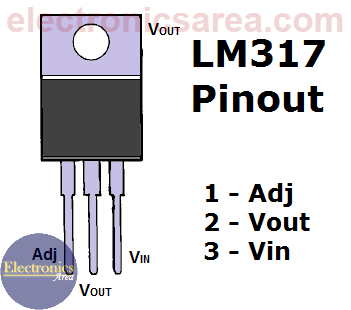 The LM317 is a 3-terminal positive-voltage regulator with a 1.25 to 37 volts output voltage range. The LM317 regulator terminals are: IN (input), OUT (output), ADJ (adjust). To achieve this voltage variation, only 2 external resistors are needed (one of them is a variable resistor). Among its main characteristics of the LM317 voltage regulator have current limitation and thermal protection against overloads. 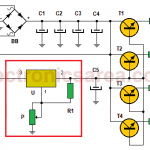 How the LM317 Variable Voltage Regulator circuit works? If IR1 (1) is substituted into the last formula (2), the following equation is obtained: VR2 = 1.25 x R2/R1. 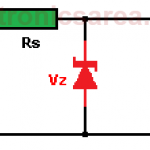 Vout = 1.25 V (1 + R2/R1) V.
From the last formula it is clear that if you modify the R2 resistor value (variable resistor), the Vout voltage is modified. The IADJ current was neglected, since it has a maximum value of 100 uA and it remains constant with load and input voltage variations. To improve the regulation, resistor R1 must be placed as close as possible to the regulator, while the R2 resistor ground terminal must be connected as close as possible to the ground connection of the load. In order to optimize the LM317 variable voltage regulator circuit operation, some additional elements can be incorporated into the design. See the diagram below. 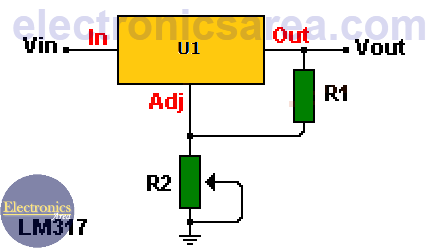 A 0.1uF capacitor (C1) is placed at the input terminal (IN), if the voltage regulator is away from the rectification components. A 1uF tantalum capacitor or a 25 uF electrolytic capacitor (C3) is placed at the output terminal (OUT) to improve the transients response. 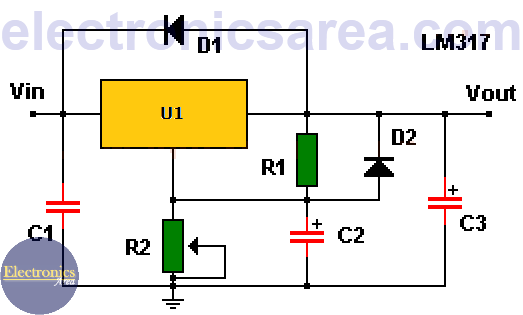 A 10 uF electrolytic capacitor (C2) is placed in parallel with resistor R2, to improve rejection of the ripple voltage. A 1N4001 diode (D1) is placed to protect the regulator against possible short circuits at the regulator input. A 1N4001 diode (D2) is placed to protect the regulator against possible short circuits in its output when capacitors are discharged.